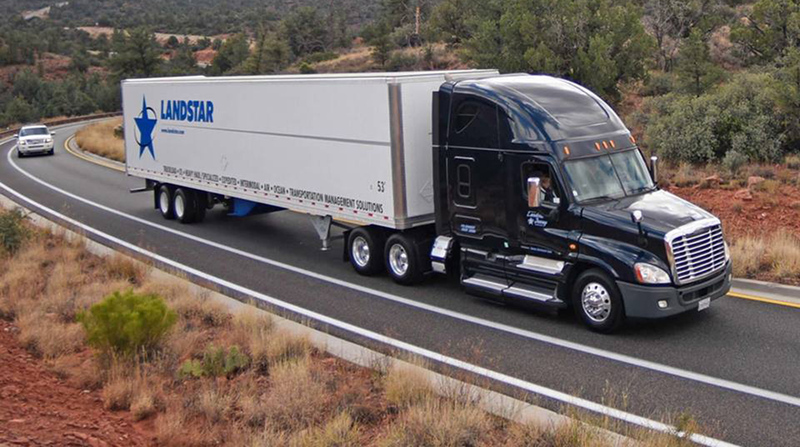 Truckload carrier and logistics provider Landstar System produced broad-based improvement among its services and generated second-quarter increases in net income and revenue, topping the consensus estimate of analysts by 2 cents a share. The Jacksonville, Fla.-based carrier, which ranks No. 9 on the Transport Topics list of the top 100 for-hire carriers in North America, reported July 26 for 13-week periods ended July 1 and June 25, 2016. Net income was $37.5 million, or 89 cents per share, on revenue before investment income from insurance operations of $870.4 million. Bloomberg News said the consensus earnings estimate for the quarter for Landstar was 87 cents. In the 2016 quarter the company earned $32.3 million, or 76 cents, on revenue of $775.2 million. Landstar uses an owner-operator/broker model and is highly connected to the spot market, which recently has been very active. Truck-rail intermodal was the single soft spot in the Landstar portfolio. Quarterly revenue declined, year-over-year, to $21.5 million form $26.2 million, and loads hauled dropped to 10,310 from 12,150 in the 2016 quarter. In addition to intermodal, the company broke out results for dry and refrigerated truckload, open-platform loads, less-than-truckload transportation and freight forwarding. All posted increases in quarterly revenue and number of loads hauled. The company’s Business Capacity Owners, or owner-operators, generated 47% of quarterly revenue, and brokers brought in 46%.